It wasn’t his movement that caught my eye – No, he wasn’t moving. He sat motionless. Stoic. Refined. As if he was a patriarch. Perhaps he was. Old and wise. A sensible creature, with depth and soul. I positioned myself in front of him, only a few feet away. He was unwavering. I lifted my camera, drew him into focus, and took the shot. 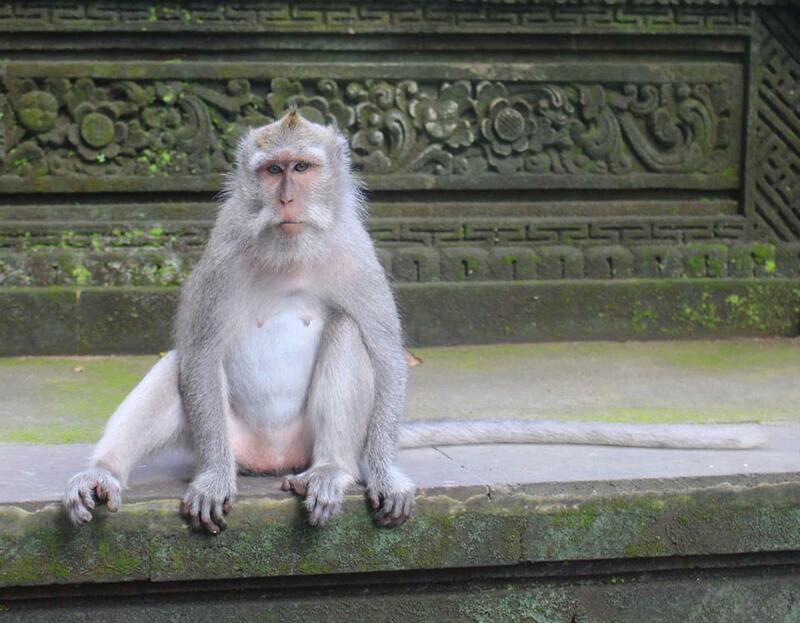 I had heard many mixed reviews before I visited the Sacred Monkey Forest in Ubud, Bali. Fortunately many negative comments were based on fear and not fact. 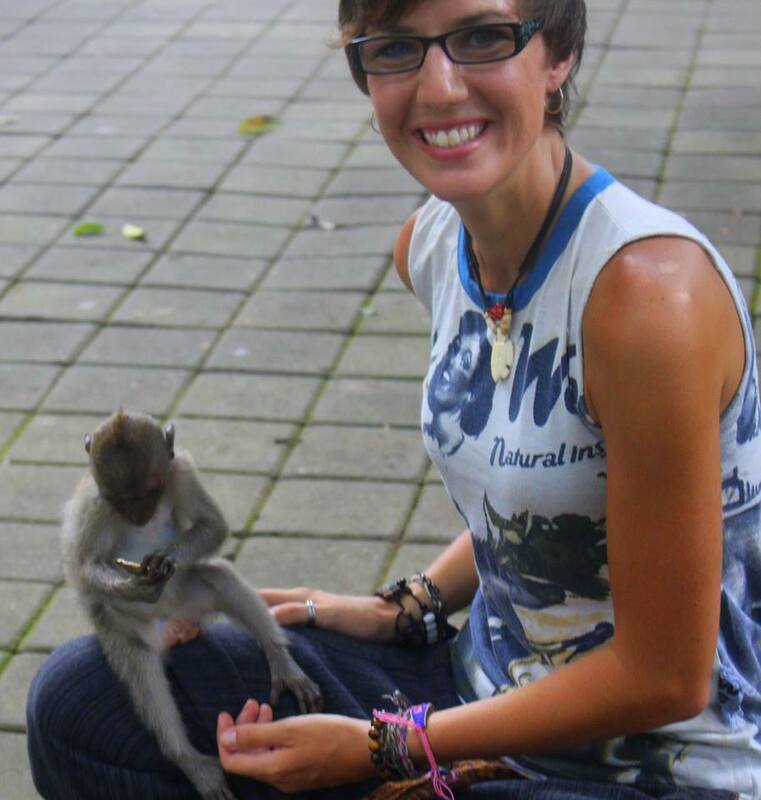 I heard everything from unprovoked monkey attacks to incidents involving rabies. So I did what anyone would do. I hopped online and scoured the internet, but found little to solidify these claims. 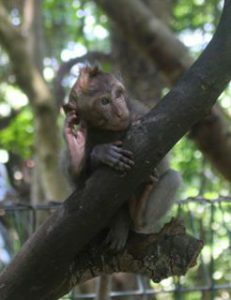 The Sacred Monkey Forest is within walking distance of pretty much anywhere near Ubuds center, (which is most likely where you’ll be staying if you visit). The entrance fee is incredibly inexpensive; 50,000 IDR for adults, which is roughly about 3.75 USD, and 40,000 IDR which comes out to about 3 dollars for children (aged 3-12). Under 3 are free, although I’d highly recommend to hold them or to always hold their hand. Children are just as curious as monkeys (and both need a bit of supervision when interacting with each other)! This experience is well worth the cost, so if you’re looking for somewhere on the cheaper side to spend a few hours, this place definitely fits the bill! However, there are rules. This isn’t a zoo and the monkeys roam completely free. Any rules that apply are clearly listed at the entrance of the forest and on pamphlets that include a map and are provided free of charge. Anyone with common sense won’t have any trouble. Keep in mind that these are animals, and they are wild animals at that. Don’t eat food around them, they will definitely try and take it. They are also extremely curious and will grab at sunglasses if left on top of your head, or purses that are open displaying snacks or shiny objects. 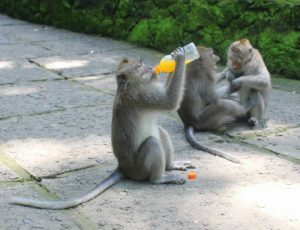 If you offer them a bottle of water, they won’t hesitate to grab it from you. You can take bags into the park, just make sure they are closed or you’ll get a bit of extra attention that you may not want! They are very interactive animals, which can make for a very rich experience when handled correctly. The forest is littered with temples, although many are still used and are respectively only open to locals in Balinese dress with the intent to pray. You will see some incredible statues of all kinds, many resembling animals or part animal-part humans. The forest itself is absolutely stunning and well maintained. There are other animals around – mainly birds and fish, as this is their natural habitat. There are rivers and bridges and a few shops with merchandise if you’d like to purchase a souvenir or two. This isn’t going to be one of those days when you’re all hyped up to see animals and then they happen to be “bedded down” or stay elusively hidden for your entire visit. 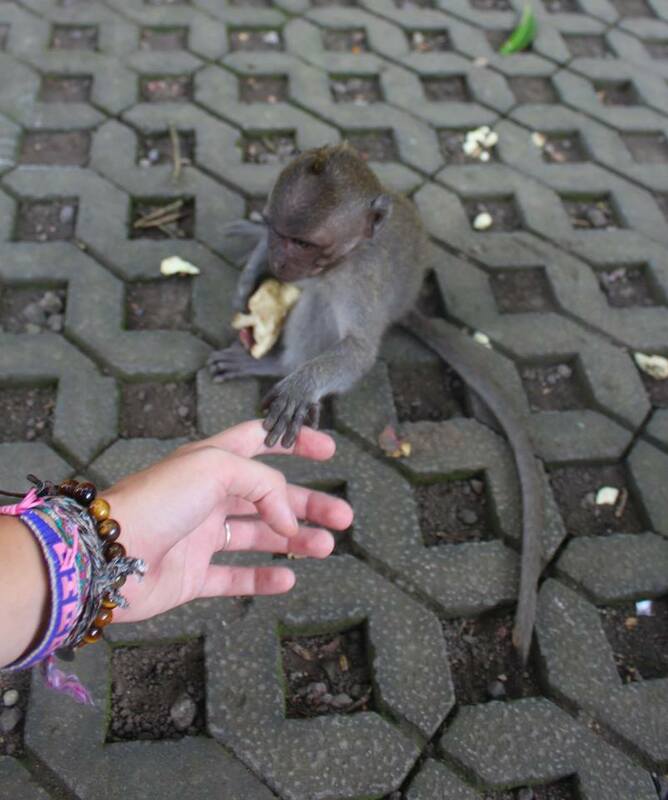 I absolutely guarantee that you’ll see monkeys, and interact with them if you choose to do so. 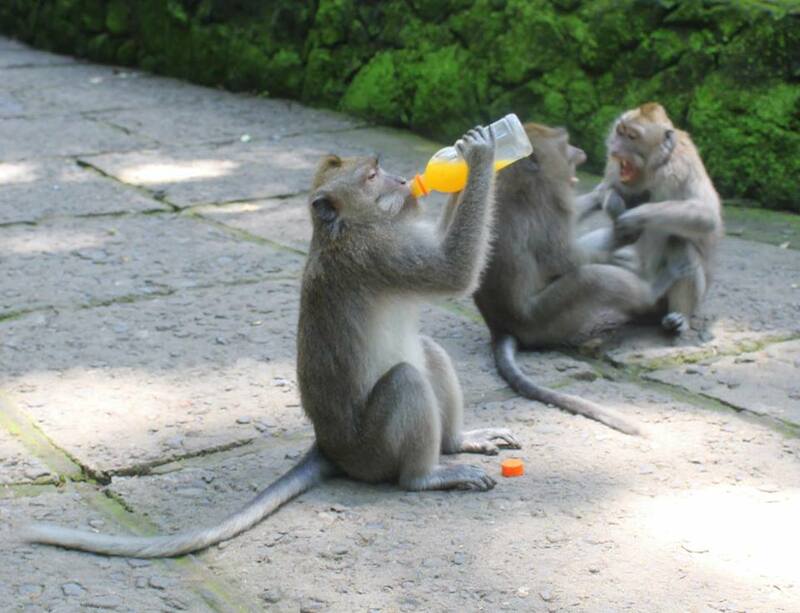 With over 600 Balinese long-tailed monkeys (or Macaque in English) living in the forest, it’s inevitable. Don’t come here if you’re the least bit afraid of monkeys. It’ll be like having a clown phobia and going to a circus hoping you won’t see one. They are highly active during the day and sleep at night, so they’ll be bustling about their own business during your visit. 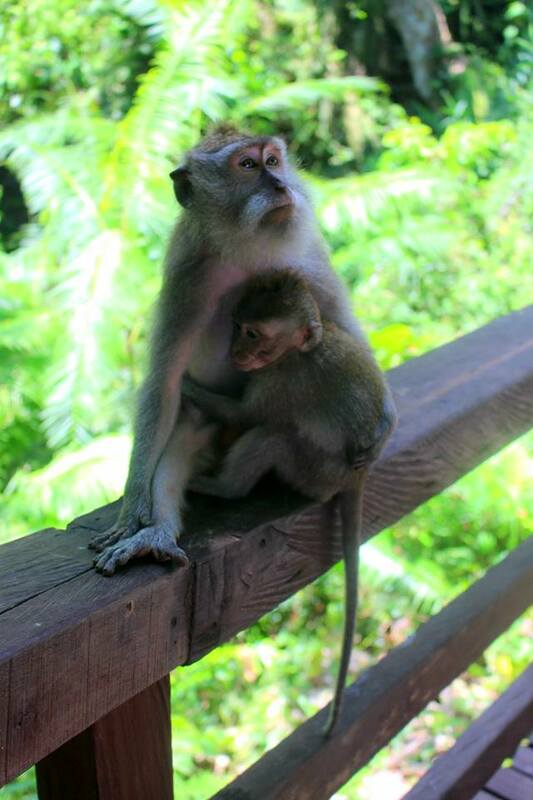 You’re also probably going to see some babies, as the Macaque mate all year long. Although super cute, curious, and adorable – be cautious where they are concerned, the parents are always near-by and are very protective. A good general rule of thumb is no quick movements. The more predictable you are, the better. You should also be prepared to see some squabbling at one point or another. There are currently 5 monkey families that inhabit the forest, so they are bound to cross paths at some point. Monkeys are much like dogs in the way that they sound worse than they are – all bark and no bite. Although I wouldn’t take my chances and bank on the, “No bite” part, as they do sound fierce and are super quick and extremely smart. But don’t let that alarm you, just stay clear, they tend to quiet down pretty soon after they start a fuss. Their diet is primarily sweet potato based. You will see “feeding stations” with the remnants of a sweet potato lunch or breakfast. They also love bananas – obviously – which you can buy on the grounds to feed them. And they will eat corn and coconut, along with some other local fruits, like papaya. Please don’t feed them any human snacks as this can make them sick. The forest is made up of over 115 different species of trees. Full and lush and alive with activity. There are thick vines and high canopies that block out the sun. It’s as if you’re in a whole other world. You’ll discover fountains full of monkeys bathing, and rivers where whole families spend their afternoons splashing and frolicking about. There are pavilions where momma’s clean their babies and juveniles have lazy afternoon naps. The Sacred Forest is quite the experience to be had, and is only about 16km from Kuta Beach – the main tourist destination when flying into Bali. You can book a van or bus at almost any shop, they are literally a dime a dozen. And when it comes to the price – haggle! It’s both fun and beneficial! Ultimately it should only cost around 80,000 IDR (my girlfriend and I got them down to 55,000 IDR. The equivalent of about $4 USD). As for the ride itself, it shouldn’t take much more than an hour or so. 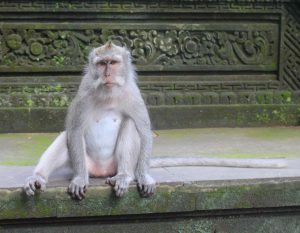 You may want to check out the Sacred Monkey Forest website for daily operating hours, and be aware of their holidays (They are closed for Nyepi, for example) before planning your trip. Make sure your camera batteries are charged – the photo-ops are simply unbelievable!